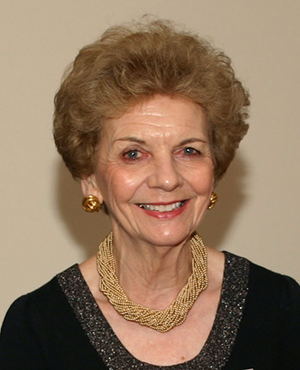 Our beloved Alumni Director, Mrs. Jane Cannon, retired recently after more than four decades of dedicated service to the Academy. Please join us as we pay loving tribute to her on Saturday, January 16, at a 4 p.m. liturgy in the Shrine and a 5 p.m. cocktail reception in the Griesedieck Conference Room. Should you wish to make an honorary contribution in recognition of Mrs. Cannon, please consider the Cindy Cannon Brooks Scholarship Fund. To give online, choose “Cindy Cannon Brooks Scholarship Fund” in the donation category field of this online donations page. The late-summer 2015 meeting of the Alumni Coordinating Council began with a celebratory visit to the Shrine to toast the recent completion of the informative walls there. They will help to educate pilgrims about the woman who is buried in one quiet corner of that edifice. Alumni Donations made that dream a reality! The south wall traces the story of Philippine Duchesne life from her departure from France through her years in Missouri and Kansas. It ends with her death in the little cell on our campus. The north wall describes the two burial paces that preceded her present, inconspicuous tomb in a corner of the Shrine. It goes on to proclaim the legacy that her pioneer spirit secured in the United States and, indeed, by its missionary enterprise, into the whole world. Parabolic sound domes in each corner offer additional historic narratives that enhance the story of our saint. Now we are ready to move down the hall to Phase III of our Alumni Project. 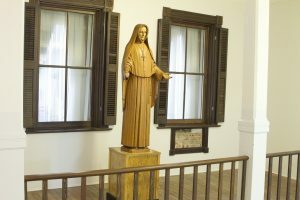 We will be addressing “Philippine’s Back Porch.” Not only was this the exterior part of the original 1835 convent, but it derived new importance in 1951 when Philippine’s remains were carried in from the “round house” in the front yard and kept here in simple reverence until the Shrine was ready to receive her sarcophagus. This area will be modestly restored with appropriate signage this year to add another dimension to the pilgrim experience. Many thanks for considering a gift to this year’s Alumni Project! CLICK HERE to donate. In anticipation of the Nov. 18 Feast Day of St. Philippine Duchesne, the Alumni Association will be sponsoring 24 HOURS OF EUCHARISTIC ADORATION in the Shrine of St. Philippine Duchesne. Eucharistic Adoration will begin with liturgy on Friday, Nov. 13 at 8 a.m., offered for Cindy Cannon Brooks, after which the Blessed Sacrament will be exposed. All are invited for prayer in the Shrine any time during the next 24 hours, and to the closing mass on Saturday, Nov. 14 at 8 a.m. While the public is invited to come for prayer at any time during this 24-hour period, we are asking alums to sign up for an hour (to be responsible for having the exposed Blessed Sacrament attended around the clock). CLICK HERE to volunteer for this important service. Please address any questions to Alumni Association President Russ Clever. Alums wishing to volunteer for one of the locations that we will be serving on Saturday, November 14 should contact Diane Carroll Boerding ’76 at philippinesfootsteps@gmail.com by November 6. Other adult members of the Sacred Heart community (e.g., parents, faculty and staff) are invited to take part, as well. Job assignments will be given out in White Center Cafeteria after the 8 a.m. Mass that morning in the Shrine. One of the many special offerings that the Academy has announced as part of the celebration of the school’s bicentennial in 2018, is a Cuvée Bicentennaire, produced by well-known French winemaker, Jean-Louis Chave. Orders are being taken now for delivery in the winter of 2017–2018. Chave is the husband of Erin Cannon Chave, a 1985 graduate of the Academy. The couple met when she worked for a California-based importer of French wines. They married and now live, with their two children, in the Rhone Valley—about one hour’s drive from Grenoble, the birthplace of Philippine Duchesne. The Chave family has been growing grapes and making wine in this region in France since 1481. The wine which will be offered, featuring the Academy’s special bicentennial logo, will be Chave’s Cotes du Rhone—commonly subtitled Mon Coeur. (Think, “My heart will abide here.”) It will be sold in 6-bottle cases for $180. It must be picked up from the distribution point at the Academy when its arrival is announced. The deadline to order Cuvée Bicentennaire: is June 30, 2016. CLICK HERE to order.